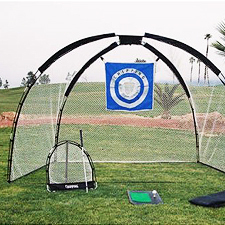 Practice your driving, chipping, and approach shots without heading to the driving range with the 3 in 1 Golf Practice Set Mat Driving Net Chipping Net and Bag. Equipped with a driving net, chipping net, driving mat, and nylon carrying bag, the set includes everything you need to hone your golf game in your backyard. The set starts with the easy-to-set-up driving net, which includes two expandable fiberglass poles that extend to 11 by 7 by 5.5 feet (W x H x D). Simply place the 1-by-2-foot driving mat in front of the driving net and swing away. The mat's high-quality nylon artificial grass surface and heavy-duty rubber base feel authentic, so you can line up your shots with confidence. (The mat includes both a fairway-like surface and a tee.) The driving net's large opening, meanwhile, will catch both straight drives and mis-hits, so you needn't worry about breaking your neighbor's window. The kit also comes with a weather-resistant 23-by-26-inch chipping net that takes up far less space than the driving net. With the chipping net, you can practice your pitches and chips in a relatively small space, including indoors. And should you want to practice at the park or while traveling, the kit breaks down and stores in a weather-resistant nylon carrying bag. Custom tailored to accommodate the complete practice set, the bag is ideal for transport and storage. You can also use the driving net to practice select golf, soccer, and baseball skills. The golf net was received in a week and was easy to set up. I like the flexible fibergalss rods that hold the unit up and it is designed well. The impact is easily absorbed and there is no danger of a ball coming back at you. Well worth the cost. - Thomas P. Byrne Sr.